Lama Zopa Rinpoche with Ven. Paldron, Root Institute, India, December 2018. Photo by Ven. Roger Kunsang. 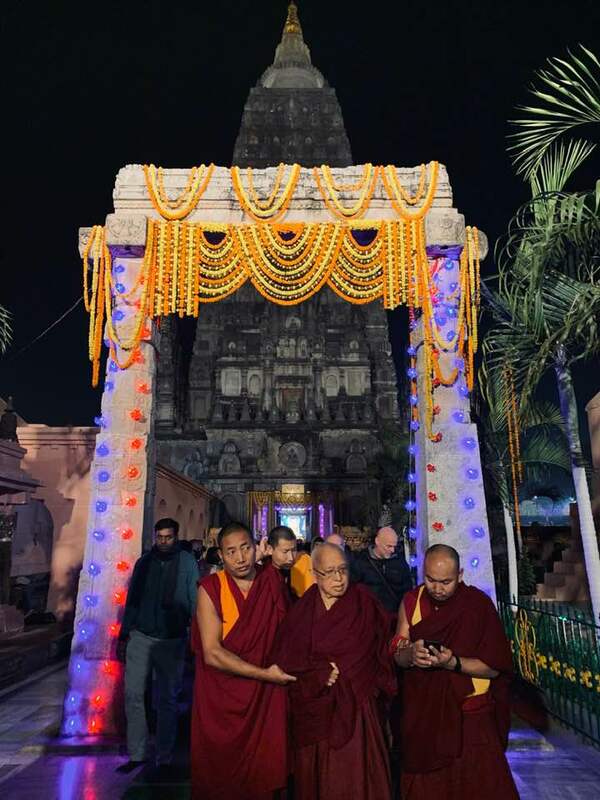 FPMT Spiritual Director Lama Zopa Rinpoche arrived in Bodhgaya, India, just before His Holiness the Dalai Lama’s teachings started on December 22, 2018. 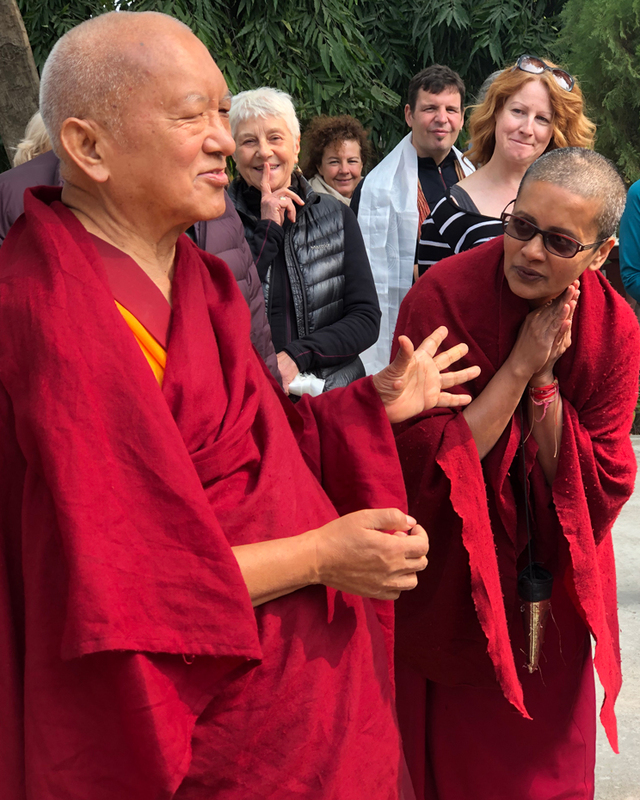 Our hearts almost stopped beating at Root Institute when Rinpoche and the entourage missed their connecting flight in Delhi. We were delighted when we heard that they were confirmed on the following flight. A few years back, Rinpoche, after missing a connecting flight, decided to spend time elsewhere instead of visiting Root. So we rejoiced that this time we had created the karma for Rinpoche to visit and stay with us! The children of Maitreya School, a social service project of Root Institute, were very fortunate and blessed to have the opportunity to recite the Heart Sutra twice in front of His Holiness the Dalai Lama and a very august audience, including rinpoches, tulkus, and high lamas. His Holiness was happy to see the children once again and was touched by their heart-felt recitation. The students were able to offer His Holiness khatas. Rinpoche was also very pleased to see the children reciting the sutra. Ganden Tri Rinpoche, Lama Zopa Rinpoche, Dagri Rinpoche, and many other lama doing puja, Root Institute, India. Photo by Bill Kane. Rinpoche very kindly requested Root to host a Hayagriva puja on December 30 to which many high lamas, including Ganden Tri Rinpoche, Jhado Rinpoche, Kelsang Rinpoche, Khadro-la [Rangjung Neljorma Khadro Namsel Drönme], and many young tulkus (reincarnate lamas), geshes and Sangha attended. During Lama Zopa Rinpoche’s stay at Root Institute, Rinpoche also met individually with many of his gurus and made offerings to them, as well as met with young tulkus and other lamas. Rinpoche also participated in the long life puja for His Holiness on December 31, organized by Namgyel Monastery and other Tibetan organizations at the Kalachakra grounds. Rinpoche was able to offer to His Holiness a beautiful Dharmachakra on behalf of the FPMT organization. 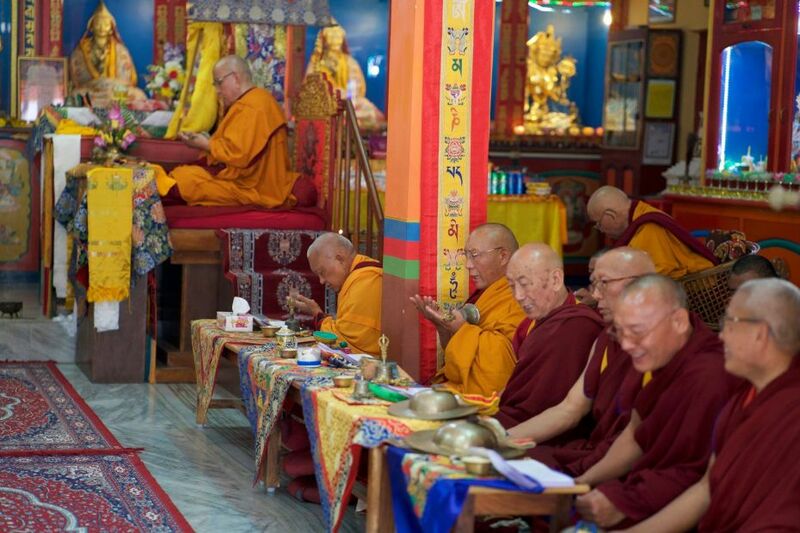 Later that day, Rinpoche very kindly attended the Lama Chopa tsog puja in Root Institute’s big gompa with protector prayers and purification practices to close out 2018 and to usher in the New Year. Rinpoche did further extensive protector prayers at the start of the New Year to remove all obstacles ,often going late into the night and the early morning. Front row: (from left) Pema Wangmo, director in training, Tushita Meditation Centre; Ven. Thubten Dekyong (Tsen-la), director, Maitreya Buddha Project, Bodhgaya; Lama Zopa Rinpoche; Ven. Tenzin Paldron, director, Root Institute; Ven. Tenzin Kunphen, spiritual program coordinator, Root Institute. 2nd row: Capucine Redon, coordinator, Tushita satellite study group in Goa; Ven. Tenzin Legtsok, director, Sera IMI House; Renuka Singh, director, Tushita Mahayana Meditation Centre; Archhana Kombrabail, acting director, Tushita Meditation Centre; Ven. Tashi, meeting notetaker; Adriana Ferranti, director MAITRI Charitable Trust; Shanti Yajnik, director, Choe Khor Sum Ling. Back row: Phil Hunt, MAITRI Charitable Trust; Ven. Kabir Saxena, chairman, Maitreya Project; Deepthy Chandrasekhar, national co-coordinator, FPMT India; Drolkar Maree Court, spiritual program coordinator, Root Institute. 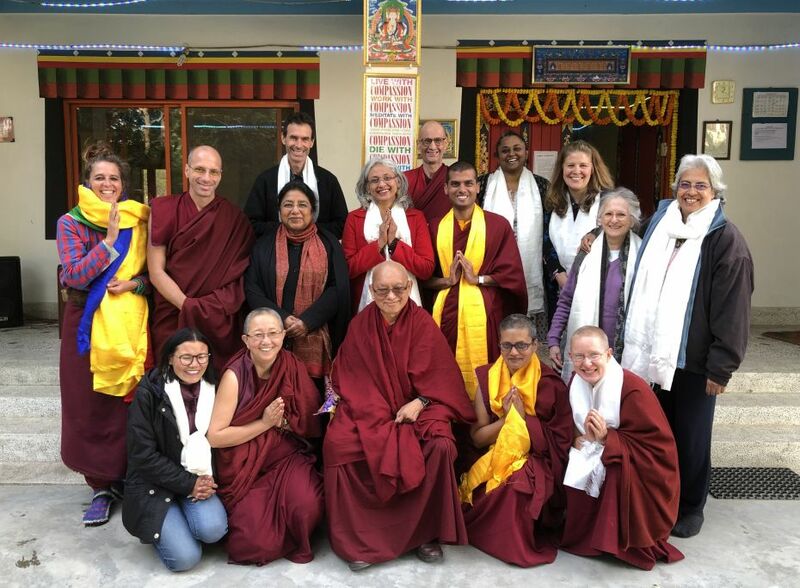 On the last day of the India FPMT national meeting, January 3, Rinpoche graced us with his presence, offering teachings and blessings in the small gompa. Rinpoche emphasized the importance of centers and the work they do and the necessity of working harmoniously and compassionately. Rinpoche invited several high lamas to lunch, including Serkong Tsenshab Rinpoche, who spent New Year’s afternoon with us answering questions, His Eminence Kyabje Ling Rinpoche, and other high lamas. On one such occasion Ling Rinpoche made an impromptu visit to the Shakyamuni Buddha Community Health Care Clinic and blessed the staff, medicines, and the clinic. We were very grateful. We were also delighted that Dagri Rinpoche taught at Root early in the year giving us a Lama Tsongkhapa and Medicine Buddha jenangs and teachings on the Heart Sutra. Lama Zopa Rinpoche invited Dagri Rinpoche to lunch on several occasions, and it was wonderful to see their joyous faces together. Lunch offered after puja, Root Institute, India. Photo by Bill Kane. 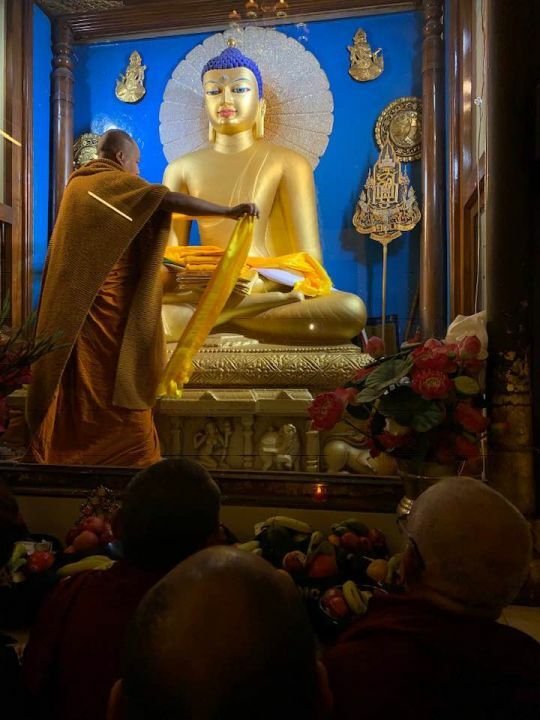 Lama Zopa Rinpoche made regular visits to the Mahabodhi Stupa during the evenings—doing circumambulations, reciting prayers, making extensive offerings and dedications, and also giving short teachings. 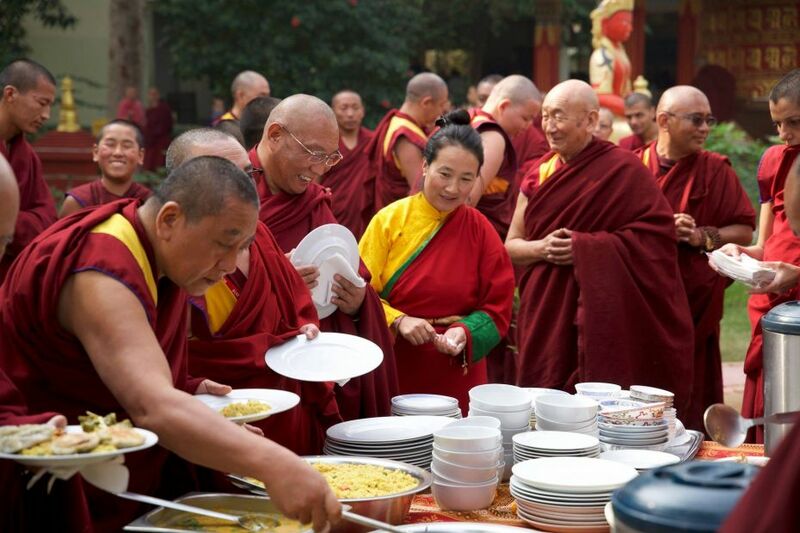 Rinpoche’s offerings would include eight to ten trays of flower offerings (or about 80 small plates of flowers). Rinpoche also offered twelve monk’s begging bowls full of fresh fruit, robes, and khatas to the Buddha statue in the main temple. Rinpoche kindly gave two public teachings aimed particularly at the Indian staff (although everyone was invited) about the necessity of a good heart and living a life in service to others and rejoicing in the opportunity to be working at a Dharma center. Offering robes to the Buddha statue at the Mahabodhi Stupa, Bodhgaya, India. Photo by Bill Kane. In front of the Nagarjuna statue at Root on Sunday, January 13, Rinpoche gave an extensive, inspiring, and very precious teaching on emptiness and dependent arising and how by clinging to the notion of an inherently existent I—ignorance—we continually create the root of samsara and our own suffering. As long as we do this, Rinpoche reminded, we are a slave to the I and to samsara and can never experience freedom or liberation. Therefore, it is important for us to be mindful of this erroneous notion of I that we are clinging to every moment of our life reminding ourselves that this I is empty, not truly existent and seeing the unfolding of events in our life as a dream. Rinpoche repeated this theme during a magnificent Heruka Lama Chopa offering on January 16 in the big gompa, which lasted over four hours! During this marathon session Rinpoche did protector prayers, purification practices interspersed with teaching reminders about our motivation, guru devotion, and emptiness. Lama Zopa Rinpoche at the Mahabodhi Stupa, Bodhgaya, India. Photo by Bill Kane. A special and big thank you to our wonderful and extraordinary team of volunteers and staff for their dedicated, compassionate, creative, and inspiring service to meet all the needs of the center during this incredibly busy and blessed time period. We are incredibly grateful to all that Rinpoche has given to all sentient beings at Root so far. We pray for Rinpoche’s long, healthy stable life and that we continue to receive Rinpoche’s teachings, blessings, and advise so that we too can become quickly enlightened for the benefit of all sentient beings.